Published on 22 January 2014. It takes a special kind of effort to be so behind the times that I’m reviewing The Undercover Economist more than three years after it was published, despite having it on my “must read” list for most of that time. As a fan of Tim Harford’s contributions to the Financial Times and his presentation of More or Less, I had great expectations for this book – and I wasn’t disappointed. The Undercover Economist seeks to explain the economic theories underpinning everyday life, from buying a coffee to shopping in a supermarket. I was passingly familiar with most of the theories being discussed, as I would imagine that most people would be, but Harford does a good job of fleshing out the details, equipping the reader with economic vocabulary, and showing how the theories work in everyday situations. Harford is clearly an excellent writer, and the book zips along at a fair lick for the most part. There are, however, some parts that drag a little. Occasionally, Harford goes to some lengths to explain the same theories repeatedly in different situations in a way that becomes a little repetitive and unnecessary in parts. I sometimes felt like the speed of the repeated explanations was a little slow, as though I was some way ahead of the book. This was a bit frustrating. But it’s not a major issue. I guess what I’m saying is that a well-abridged version of the book would be no bad thing. There are also bits of the book where I feel like Harford strays a little too far into relating a particular point of view, rather than setting out the wider picture as I would expect from a book like this. I am actually interested in Harford’s opinions on globalisation, for example, but don’t think that this is necessarily the place to communicate his point of view (almost) exclusively. I felt that a little more balance would have been welcome in this introductory book. But these are niggles. Economics is often portrayed as dry and theoretical, and The Undercover Economist shows it to be anything but. It sheds light on the economic decisions we all make everyday, and the way that we are economically manipulated by corporations and governments – for better or worse. It is absorbing and enjoyable – not words that necessarily spring to mind for books about this particular subject matter. So whilst there were some rough edges, I enjoyed The Undercover Economist. And perhaps the best I can say is that the sequel is on my “must read” list… and I think I’ll get to it some time before 2017! 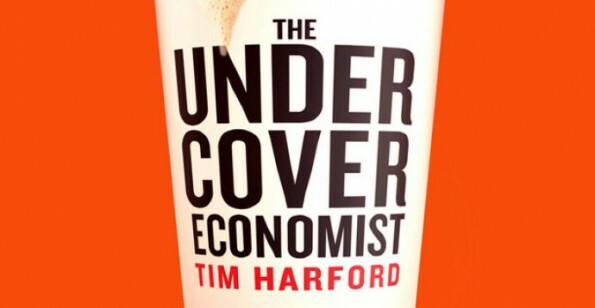 The Undercover Economist is available now from amazon.co.uk in paperback and on Kindle. This 2,124th post was filed under: Book Reviews, Tim Harford.